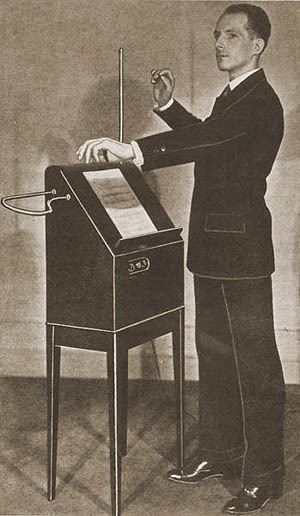 This Sunday, August 15th, is Lev Termen's birthday, he was known as Leon Theremin in the U.S. We champion the theremin as a serious classical and experimental instrument, but the early popular side of the theremin in records and film is important too. The flying saucer would not have had it's iconic ooo00OO00ooo sound, there would not have been a Tannerin (see Beach Boys), or even the Moog Synthesizer without Lev's invention. It is very likely that up until the YouTube era, Samuel J. Hoffman was the most heard thereminst in America. He was the primary, if not only, thereminst in Hollywood during the forties and fifties recording records and film scores, and even some T.V appearances. For Lev's birthday this year I'll indulge my love for B Movies. No "The Day the Earth...", "Ten Commandments" or "Spellbound" this time, here's a short list of B Flicks and Spooky Movies you'll hear the theremin in. Please add on your favorites in the comments!